We have long suspected that Tesla had enlisted the help of APX Labs to modernize its Fremont factory, but nothing was confirmed until now. Although no longer available on the APX Labs website, we previously saw various images of the Tesla Fremont factory used as stock imagery on the site (pictured above), with text laid atop suggesting that APX Labs’ software is the “secret to the factory of the future”. That factory of the future that APX refers to is seemingly referring to Tesla’s Fremont factory as you can see Tesla vehicles and other familiar scenery in view. In case you need more evidence, the below photo was also publicly visible on APX Labs’ website for quite some time before just recently being removed. The image shows multiple black Tesla Model S vehicles in view with a screenshot from APX’s “Skylight” software in the top-right hand corner. This is a familiar view for those who have used Glass before — the device is actually capable of capturing similar shots itself called Vignettes. 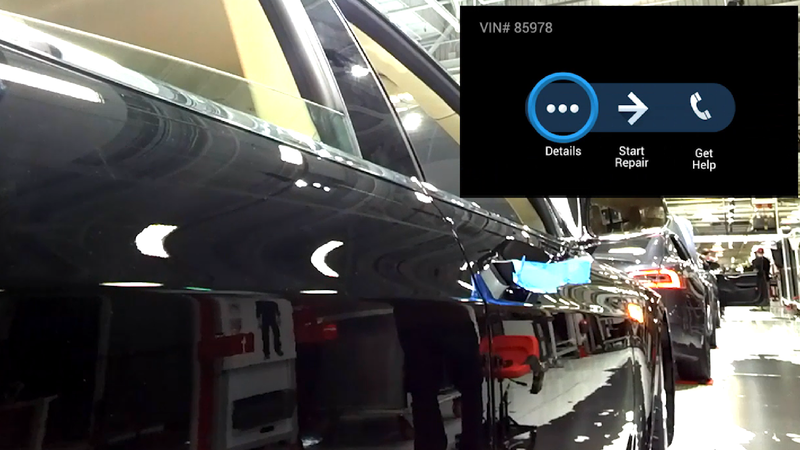 In the screenshot, the software shows what is purportedly a vehicle’s VIN number, and various options for a factory worker to act on. While APX Labs offers solutions spanning a variety of wearable devices (including head-mounted devices from Vuzix, Recon, Epson, and others, as seen on its Skylight page), it’s very likely that Tesla is deploying Google Glass units at its Fremont factory. It’s also likely that those units are the new Enterprise Edition units — featuring a robust hinge, waterproofing, and internal spec bumps — that we told you about across across several exclusive reports last year at 9to5Google. We’ve also ourselves seen an unreleased Glass promotional video made by APX Labs in collaboration with Google. In the video we viewed last year, Tesla employees used the older Google Glass Explorer Edition to demo APX Labs enterprise wearable software Skylight. Why isn’t it this older hardware that Tesla is using? Explorer Edition hardware is becoming dated, and sources close to Google have said that the company has completely or nearly stopped making the older Explorer Edition units. Interestingly, this could also have some implications for the company’s Gigafactory in Nevada as well. Tesla has said that it plans to hit full production capacity in 2020, and that it will employ roughly 6,500 workers at the factory. The curious hire of a long-time Lego manufacturing executive suggests that the company may be working to automate the factory as much as possible, and wearable technologies like Google Glass running APX Labs’ platform could be critical to that goal. But wait, isn’t Glass dead? Not yet. Earlier this year, Google Glass social media accounts finally were shut down after many months in lull. This didn’t come as much surprise as plans to bring Glass to the consumer market (at least by that name) had long been abandoned, but multiple people familiar with the matter said at the time that Glass Enterprise Edition was only just starting to see wider adoption. This new enterprise hardware lives on under the umbrella of Project Aura.